3D printing is revolutionizing the way objects are created, from plastic toys to ceramic dental crowns. But the seemingly boundless possibilities of 3D printing technology have one major limitation—the printers themselves, which are large, bulky, and stationary. Robert Flitsch didn’t like being constrained by the boxy shape of the 3D printer he used while he was a student at the Harvard John A. Paulson School of Engineering and Applied Sciences. So this mechanical engineering concentrator developed a wheeled additive manufacturing machine that can literally run (or drive) circles around a traditional 3D printer. He recently launched a startup named Addibots (a portmanteau of additive manufacturing and robots), to develop and market his mobile 3D printing robots. An AddibotTM is a mobile robot, either remote-controlled or autonomous, that holds an array of additive manufacturing printheads on its undercarriage. These high-resolution printheads enable the robot to 3D-print using different materials as it drives along a surface. Ice was the surface Flitsch had in mind when he initially developed the concept. A lifelong hockey player, he conceived the additive manufacturing robot as an efficient tool to resurface an ice rink that has been chipped up by skates. 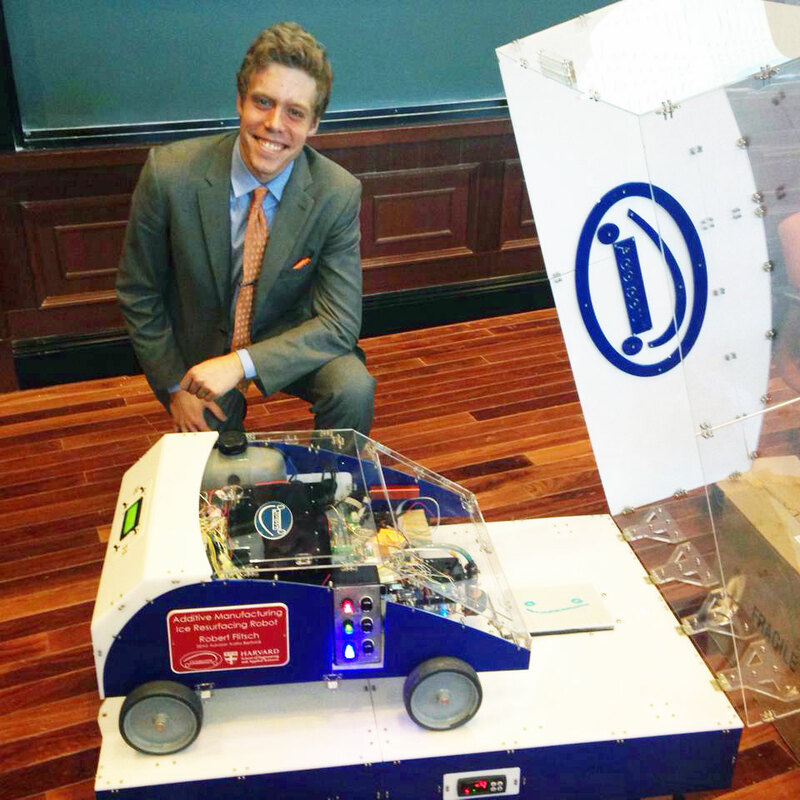 For his senior project in Engineering Sciences 100, he built a prototype of an additive manufacturing robot that was able to extrude ice onto the surface of an uneven skating rink. “I soon realized that the best thing about this technology is that it is really only limited by what you can think up,” he said. After brainstorming other applications for Addibots, Flitsch decided to focus on road resurfacing. He is currently prototyping an Addibot that would be able to move along a road at a constant speed, using a specialized injector array to resurface the road with a combination of different materials. The machine’s ability to streamline resurfacing work could help public works departments across the nation meet the massive demand for new and better roads. He doesn’t see Addibots as a replacement for human workers, but rather as a way to improve roadwork and enable municipalities to perform routine maintenance, rather than spending additional time and tax dollars reactively filling potholes. “Road resurfacing Addibots would also be a great way to move caustic materials, like tar, farther away from the people who would be working on the roads,” Flitsch said. By incorporating different printheads into the injector array, the Addibot could easily augment resurfacing material with specialized elements, such as carbon nanotubes, which would improve road durability, Flitsch said. Eventually, the technology could even “print” sensors into the road surface that would be used by traveling autonomous vehicles. Flitsch, who is currently seeking funding sources to advance his prototyping efforts, is hoping to bring an Addibot to market within one to three years. And he is considering other applications for mobile additive manufacturing robots. “Once you get rid of that confined workspace and you make the world your workspace, there is no telling what you can do,” he said.